It is the perfect time to think about food for thanksgiving as it is coming really fast. Here is a tasty and low carbohydrate recipe for you, trust me you don’t have to take any cooking classes or don’t have to be a great chef for making deviled eggs. You can serve it as a starter in your thanksgiving, Christmas, Easter or in your family get-together. If you have never made deviled eggs before, I assure you it’s going to be easy and simple. Here I will give you the step by step process so that it will be easier for you. This recipe is for 2-3 people. Boil the eggs for 10-15 minutes, once it is done replace the hot water with cold and let it cool down for a while. Now peal the shells and let it sit in the cold water for couple of minutes. Now slice these eggs lengthwise with a sharp knife and make it two parts as shown in picture. Gently remove the egg yolks, place in a small mixing bowl and arrange the eggs white in a serving plate. Mash these egg yolks with a fork, once it’s done add mayonnaise, salt, paprika and black pepper to it. Again mix mashed yolk and mayonnaise well, make a fine paste. Now fill a tbsp of yolk mixture to the eggs white and sprinkle some red paprika, spring onion and coriander leaves on top. Now your deviled eggs are ready to serve. You can serve it with your favorite chips and salad. Please feel free to post your comments and suggestions. 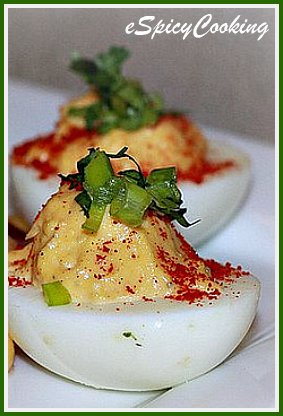 Your Deviled Eggs looks amazing and so mouthwatering. 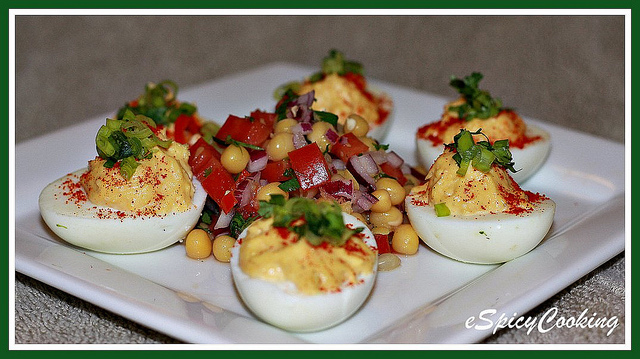 Oh boy your Deviled Eggs looks so colorful and it seems very easy to make. Let me try it today and i will get back to you with my experience. Thanks a lot for this awesome and easiest recipe.